OzMosaics Mosaic Store SHOP online! Mosaic project Take a look! Workshops include: Beginner, Advanced, Smalti, Retreats, 3-D and more! Mosaic instruction - how to use and shape mosaic tesserae, including, china, porcelain, ceramic, tempered glass, mosaic tiles, glass, wine and bottle glass, glass gems, textured and safety glass, smalti gold tile, smalti bricks, smalti gold tile and millefiori. OzMosaics Mosaic Store has everything you need to make mosaic art and craft. One of the biggest range of Mosaic Materials. 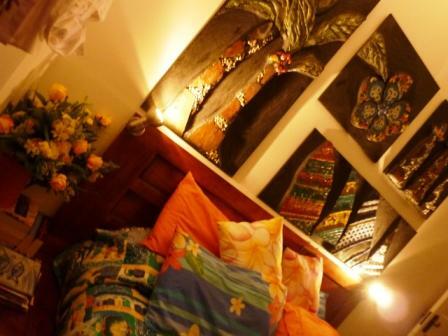 Well-equipped, inspirational, mosaic studio/school in Brisbane, Queensland Australia. You can search the web, looking for a professional artist, studio and supplier for your mosaic projects,commissions or workshops! Save time and energy, to straight to the wizard of mOz and learn to art of mosaics at Studio OzMosaics, with flair, style and with a leading mosaic artist! Don't waste time and money learning the hard way, enjoy a mosaic workshop, meet new friends, have fun and you will be cutting curves, placing tile and making beautiful mosaic art. Sandy explains- Learn the art of mosaic with OzMosaics, and get started with your mosaic art and craft project ideas. Life is full of mosaic madness and mosaic magic at our school of mosaics. 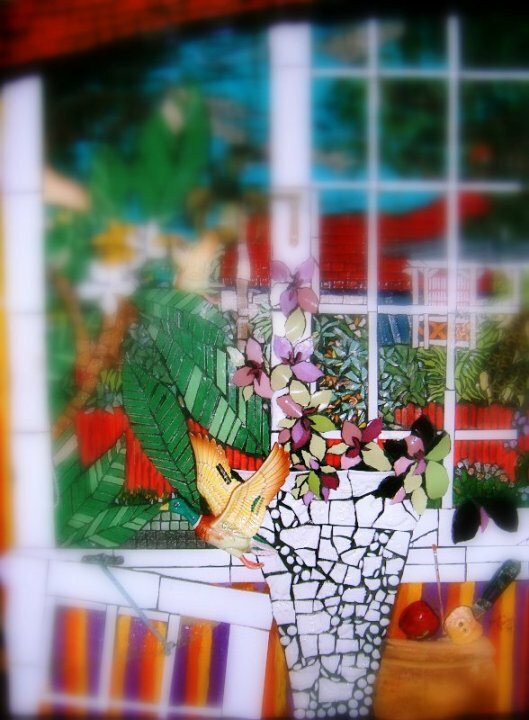 Beautify your garden with a mosaic art wall mural featuring a mix of ceramic tile, mirror, found objects or smalti. Enhance your home with mosaic decorative mirrors to reflect a mosaic art wall. You will soon be on your own mosaic mission and your artist statement will reflect your art journey. Study mosaic history and take photographs of your mosaics in the garden and your home. Set your dinner table with mosaic glass decorated candles and give a gift of a breakfast mosaic tray. If you are considering building or renovating, mosaic a door. We are Australian Suppliers of mosaic, mosaic on mesh and beautiful mosaic artworks. We have a mosaic club, CLUB mOz and we love to discuss commissions/bespoke artworks. Building a new pool? Consider mosaic for your pool tile art. We design pool mosaics, panels and borders, try our mosaic design service. pplies, sponges, mixing tools, epoxy grout, decorations, christmas decorations, how to grout a mosaic work of art, customised mosaic artwork, craftsmart, grout tints, colourants, paint, scorer, scorers, running pliers, nipper tools, school mosaics, ideas for teachers, sanded grout, unsanded grout, glow in the dark, grout and waterproof sealant, glitter, mosaic teacher, mosaic school, mosaicart, mosaic education,laying smalti for mosaics, mosaic matters, craft classes and supplies, passion for mosaics, passion, love of mosaics, smash, smashing, hammer, hardie, hammer and hardie, h & h, ergonomic, studio set up, work area, work space, easel, how to photograph mosaic art, mosaic slide show, mosaic pictures, mosaic photos, mosaic gallery, team, group, craft fair, craft show, mosaic exhibition, rocks, international, colour and texture, new world, products, glass pebbles, opal, gold streak, gold streaked, streaky, video, you tube, face book, twitter, byzantine, 24 carat, online source, source, exclusive supplier, traditional mosaic, chinese smalti, asian smalti, diy, kits, mosaic kits, mosaic wall, mosaic, mirror. wine bottle, flowers, china, ceramic, pique assiette, reverse method, indirect method, mosaic tiles, brown paper, gifts, easter egg, tile grids, brown paper, mini tiles, toys, doll, portrait, face, dress, fashion, art show, display, products, product, supplies, supplier, , street sign, sign, signage, bench top, bench, tubs, planter box, fence, mountain, disco, butterfly, butterflies, cement sheeting, wedi, wediboard, kiln, glass kiln, glass fusings, mollies, cupboards, furniture, dressers, teapot, teapots, frypan, frypans, hubcap, hubcaps, picture frames, trophies, trophy, shark, shells, pebbles, wire, eyes, glasses, bras, conference, conferences, committee, lepponit, byzantine. , traditional mosaic, contemporary mosaic, modern mosaic, mosaic design, bamm, sama, australian artists,feature walls, pool borders, borders, friezes for bathrooms, indoor mosaic glue, outdoor mosaic glue, marble, online mosaic instruction, patterns, mosaic art works, Brisbane, Australia, mosaic art, mosaic queensland, mosaic tiles, mosaic tile, smalti, tools, glues, grouts, glass, mirror, Leponitt cutters, mosaic tools, mosaic cutters, weldbond, mac glue, glass gems, millefiori, fused glass, glass tiles, mosaic tiles, mirror, stained glass, maanz, Marmox light weight board, gems, mosaic mesh, mosaic tile art, tiles, glass tiles, glass scorers, pots, gifts, gift vouchers, art and craft, mosaic craft, online magazine, magazine, newsletter, professional mosaic artist, Dynasty Smalti, Laticrete products, workshops, mosaic art studio, mosaic school, mosaic tutor, mosaic teacher, mosaic supplies, specialty art projects, mosaic projects, art, craft, artist, glass, mosaic murals, classes, jewellery bases, blanks, chains and more! Mosaic Australia,mosaic studios, design studio, mosaic design studio, mosaic courses, organising your mosaic studio, mosaic art school, micro mosaic, learn mosaic crafts from home, flying arts, artist in residence, school teacher, mosaic photos, mosaic art australia! The mosaic studio & mosaic shop is overflowing with materials, tiles & tools! Beginner to advanced workshops are fun, relaxed and exciting. Mosaic Art Studio - Learn the Art of Mosaics. Quality Workshops, Classes & mosaic supplies at Affordable Prices! Stockists of mosaic products for the mosaic crafter to professional mosaic artist! We have everything you need to make mosaics! Contact us! - we want to be your mosaic supplier! Sandy has been teaching mosaic art classes at OzMosaics- for over a decade! OzMosaics Online / Studio Store is dedicated to bringing our customers and clients high quality, professional products and services. Corporate clients, art and craft enthusiasts and professional mosaic artists use our tried and tested products and our commissions are highly regarded. We teach, we make art, we sell art, we have the products! We know mosaics! Learn the methods of mosaic, how to mosaic, choosing the right adhesive for your mosaic project, how to glue glass mosaics, mosaic glue and adhesive for indoor and outdoor mosaics. What is the best adhesive for your mosaic project? OzMosaics is the Australian Distributor of MAC glue. Mosaic Pendant bases have arrived! Sandy prefers to use Laticrete- A product that lasts the distance! Mosaic Assn Australia and New Zealand. OzMosaics Studio specializes in mosaic fine art, commissions, workshops, mosaic supplies and resources. Sandy Robertson is a mosaic mixed media artist working and teaching at Studio OzMosaics - Australia. Your one-stop online shop and studio for mosaic art and craft. We stock a huge range of metallic and glitter tiles, glass beads, fusings, Dynasty Chinese Smalti, vitreous glass tiles and lots more! Whether you are looking for a mosaic artist to make the mosaic of your dreams for your home, business, gift or garden, searching for mosaic supplies, mosaic classes and workshops, mosaic information or simply love to look at mosaic art, we welcome you to browse OzMosaics web site and web shop. OzMosaics stocks and sells everything you need to make mosaics from glass tile to grout , tools and glue. A huge range of mosaic glass tile and smalti is available in our studio and web shop. Try the Dynasty Smalti - huge range of colours - quality Smalti at affordable prices! When you need something special in your mosaics, something different, contact OzMosaics! Mosaic pool and garden wall murals by OzMosaics - perfect for your home and garden. Laticrete Products - Everything for mosaics! Dynasty Smalti! Light Weight Marmox Bases! Workshops - Classes - Studio - Gallery - Club mOz - Mosaic Community Art Network ARENA - Mosaic Online Store - Mosaic Studio Shop - Galleries Join in mosaic groups to discuss mosaic art with mosaic enthusiasts around the world! Sign up to be a registered member to access the Mosaic ARENA! Chat Room, Blogs, Photo Albums - so much to do - together we share and grow our love of mosaics. * Commission OzMosaics to make a custom made mosaic or learn to make your own mosaic masterpiece! You are only limited by your imagination: Let us help you cover the surfaces! When you need tiles, shop at our mosaic store. Make it all! a mosaic birdbath, mirror, photo frame, table, garden ornament, statue, column, pedestal, bathroom, kitchen, indoor, outdoor, floor, ceiling, wall, path, pot, planter, ball, seat, chair, wheelbarrow, gift, tray, bird box, letter box, car, surfboard, vase, mural, sink, bath, bird bath, fountain, sculpture, modern, traditional, spontaneous - mosaics. mosaic tools, mosaic workshop, mosaic workshops for everyone. Dynasty Smalti, Art Glass, Smalti Australia supplier, Australian Smalti Distributor, Mosaic Tiles in Brisbane Floor and wall tiles, compare us to Bunning’s tiles, mosaic art craft supplies, tiles Brisbane, Brisbane tile Shop, Complete tile and stone, ceramic tile and glass, interior and exterior tile and glass, glass mosaics, pool tiles, pool murals, Brisbane bathroom tiles, everything for mosaic art and craft. Sign up for OzMosaics free newsletter - enter the studio and register! Be warned - mosaic art is addictive! Australian mosaic school - classes courses workshops Book in today! Everything for mosaics Professional products and services! mosaic vitreous tile, Smalti, glass mosaic, Smalti mosaic, Dynasty Smalti, glass fusings, glass tile, Leonia mosaic cutters, tools, grout, mosaic fibreglass mesh, thinnest and more! jewellery bases, chains, bails, millefiori, fused glass pendants (jewellery! ), Smalti, tiles, glass, glue, grout, sealers, mosaic fibreglass mesh, dynasty Smalti, beads, mirror, epoxy glue, epoxy grout, sponges, classes, workshops, lessons, commissions, bespoke art, corporate workshops, team building fun mosaic workshops, art gallery, public art, specialty glass, custom-made mosaics, vitreous glass mosaic tile, ceramic, stained glass, mosaic jewelry, leponitt, laticrete, mac glue, weldbond, and more! Sandy has a Paragon glass kiln and members of the Mosaic Addicts Group are enjoying learning the art of hot glass fusing and slumping, mosaic experiments of course. Sandy Robertson - mosaic artist and mosaic teacher. Sandy makes mosaics to order and prides herself on bringing the client's vision to mosaic reality. Using traditional techniques combined with modern influences, Sandy brings a fresh approach to mosaic art. Her unique 3-D techniques developed of years of honing cutting skills and using the exceptional Laticrete products has produce mosaic art for all occasions - pools to floors, wall art to table tops, garden landscape decor and interior designs! Find out from Sandy how andamento, opus and style makes your mosaic flow and capture the essence of your design ideas. OzMosaics online and studio mosaic shop stocks all mosaic art supplies, including, tiles, grout, glue, adhesives, thinset, smalti, vitreous mosaic tiles, glass tiles and more! The website has fabulous mosaic photo and movie galleries. Sandy is continually updating the site...join the free mailing list for regular news and more! workshops, mosaic tiles, tools, adhesives, grout, fibreglass mesh, grids, smalti & more! Shop on line for mosaic supplies! Sandy runs mosaic workshops and classes at her mosaic workshop studio, suitable for beginners to advanced students, of all ages. Learn to mosaic mesh method, direct mosaic method and 3-D mosaic artistry. Sandy tutors at schools and in the community at large. OzMosaics has a professional design facility and can cater to all mosaic commissions, large or small and ....to suit the budget! Sandy Robertson has lots of mosaic tips and tricks up her sleeve and loves to share the joy of mosaic art. So come on in and join in the mosaic madness. Be Warned~! Mosaic art is addictive! If you have a mosaic quesion about the art of mosaics contact our studio workshop. Our phone or email is your mosaic helpline, but it's best all round to attend a mosaic workshop or attend for some private tuition or lessons. A little investment will go a long way, with your mosaic design skills. Sandy has a band of mosaic addicts and much fun is had on the mosaic addicts forums and groups. CLUB mOz is waiting for you. Newsletters, updates, video snippets, it's all happening at Studio OzMosaics Australia. When you want to be creative or want Sandy to create for you, contact OzMosaics! We supply glass mosaic tiles, mosaic tiles, mosaic tools, and more mosaic products! We are a one stop mosaic supplier online store or visit our studio shop by appointment. OzMosaics will introduce you to other unusual materials and mosaic sources that you may not have normally considered! Sandy thinks outside the mosaic square and shows you traditional and contemporary mosaic techniques used in mosaic design, such as different ways of cutting and laying mosaic tile. Use our high quality mosaic glue, sanded grout mesh. We stock waterproof membranes to protect your mosaic base.Sandy provides friendly, helpful advice with mosaic questions on grouting, outdoor mosaics and tiling methods. Sandy specialises in mosaic art wall murals and decorative mirrors and tables. Swimming pool murals on mesh, garden wall murals are created and cut by a mosaic artisan. Whatever you need to make mosaics - OzMosaics has the materials and professional expertise. OzMosaics is the Brisbane base for Australian Smalti! We have chunks, chips, blocks, a mosaic stir fry of materials!